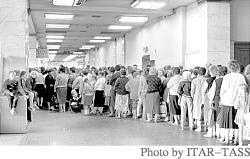 Muscovites hit by chronic shortages lining up to buy children’s clothing at the Detsky Mir department store in August 1991. "How can the economy advance if it creates preferential conditions for backward enterprises and penalizes the foremost ones?" From a purely economic perspective, it is hard to believe so few people saw the collapse of the Soviet Union coming. There were clear signs that changes more radical than perestroika were afoot. One of the clearest of these was the increasing desperation with which Mikhail Gorbachev pursued Western financial credits from the moment he came to power in 1986 — economics has always been a confidence game, and when confidence is shattered markets and even countries crumble. Yet practically no one saw it coming. In fact, almost as remarkable as the relatively bloodless disintegration of the mighty Soviet empire itself is that, a decade later, there is still no consensus on what, if anything, Gorbachev could have done differently to avoid it. A series of articles dedicated to the 10th anniversary of the August 1991 coup. Was the breakup really inevitable? Couldnt it have been avoided by taking a path similar to the Chinese, who gradually reformed their command economy into a more market-oriented and consumer-friendly society? Why did the Wests top Sovietologists, including those who worked for the U.S. Central Intelligence Agency, fail to predict it? These are some of the questions that continue to puzzle politicians, policy-makers and academics 10 years on. As far back as the 1970s, many researchers pointed to a growing weakness in the Soviet economy. By 1991, it became clear that the Soviet Union was not only experiencing an economic crisis, but a demographic one as well. That year, Georgetown University professor Murray Feshbach, together with Lester Brown and Alfred Friendly, published a book called "Ecocide in the USSR: Health and Nature Under Siege," which drew attention to the dangerous combination of increasing ecological destruction, deteriorating medical services and the growing number of early deaths in the Soviet Union. The book found that while the number of 18-year-old males in the six Moslem republics was growing, it was shrinking in Russia. Based on this and other demographic problems, Feshbach was one of the first to predict that the Soviet economy, which had an insatiable demand for labor, would eventually come to a grinding halt. "While I then expected it would take a few more years, not one year, the principle in this case was the same," Feshbach said in a recent interview. In a similar manner, a growing number of researchers were forecasting a looming budget deficit, indicating a further weakening of an economy already reeling from Gorbachevs crackdown on alcohol consumption and a global slump in oil prices in the second half of the 1980s. And there were also plenty of other problems. "They were missing movement toward the new technology," said Marshall Goldman, associate director of the Russian Research Center at Harvard University and author of "What Went Wrong With Perestroika." Seeing these problems accumulate in the 1980s, most economists predicted an economic slowdown, which they often described as "muddling through." But even the most far-sighted researchers were unable to collate all the various findings and correctly predict the collapse of the whole system. Former Sovietologists now say the large margin of error in their economic forecasts was inevitable given the relatively small number of people in the field and the lack of communication with their Soviet colleagues. "Russias view of Sovietology as a powerful, prestigious field was wildly off the mark," said Vladimir Kontorovich, an associate professor of economics at Haverford College in Pennsylvania. Kontorovich, who emigrated to the United States in the mid-1970s, said that, because of scarce financing and limited career prospects, the gloss wore off Sovietology as a profession shortly after the field was created in the 1950s. According to Paul Gregory, a professor of economics at the University of Houston, there were only three groups in the United States involved in researching the Soviet economy — government analysts in the CIA and the Department of Commerce, academics and a couple of consulting companies such as PlanEcon and Rand Corporation. Given the narrow ranks, each researcher focused on a small field of study, so if one person made a wrong forecast in his or her area, the rest of the pack followed the wrong trail, Kontorovich said. "It was a very small group of people who knew each other closely and who did not criticize each other." As a result, disputes, if they arose at all, were not between members of the U.S. academic community but between American and British scholars and U.S. researchers and Russian emigres. Of the emigres, the best known were Naum Yasny in the 1950s and Igor Birman in 1970s, who were treated with suspicion. Some emigres, however, did manage to contribute some major breakthroughs despite the cold welcome they received. Birman, for example, was the first to draw attention to the ballooning Soviet budget deficit. "The irony is that first major criticism of Western estimates came from inside Russia," said Gregory. The first major critic of the Soviet economy was Grigory Khanin, an economist from the Institute of Management Systems in the Ministry of Instrument-Making. Khanin lost his job at Novosibirsk University for teaching heretical views on the Soviet economy. In the early 1970s, Khanin began to comb through and revise statistical data published by the Soviet State Statistics Agency since 1928. "When I first made a presentation of my studies in Zvenigorod [outside of Moscow] in 1976, one could hear a fly buzz in the room," Khanin said by phone from Novosibirsk. Armed with revised statistics, Khanin not only identified falling growth rates but went as far as to predict in the early 1980s that national income would contract 20 percent by 1990. Shortly before Khanin went public with his views, a Soviet emigre in London, Anatoly Fedoseev, published two books — "Trap" and "On New Russia: Man and Socialism" — in which he predicted a crippling economic crisis. But Fedoseev kept a very low profile and practically disappeared from Soviet debate by the mid-1980s. Perhaps the biggest irony about the collapse of the Soviet economy was that the states own economists saw it coming but were powerless to do anything about it. "One of the ideas was to approve a five-year sanitarnaya pyatiletka [sanitary five-year plan]," said Gennady Zoteyev, former deputy head of the national accounts department with Gosplan, the state planning agency. "It was clear that the system had lost its equilibrium, so some economists suggested a pause to rectify the imbalances." The Soviet leaders, however, forced Gosplan to paint rosy pictures of growth and were unwilling to face reality. In the late 1970s, Gosplan chairman Nikolai Baibakov unsuccessfully tried to convince Leonid Brezhnev and other party bosses of the real state of the economy. "Brezhnevs reaction, after the Politburo heard the report, was that Baibakov was exaggerating and that, unlike the Politburo, Gosplan was not working properly," said Zoteyev. "Take your manuscript away so that I never have to see it again," Brezhnev said, according to Zoteyev, who participated in drafting the report. Gosplan lived through a short period of optimism from the time Yury Andropov came to power in November 1982 until his death from a kidney disease in February 1984. His efforts to resurrect the economy by means of stricter discipline were later dubbed by many of his contemporaries as "the last-ditch attempt to revive Stalinism." "Were it not for Andropov, the system would have disintegrated faster," said Khanin. "It was Andropov who, tightening the screws, ruined my forecast [of a 20 percent decline]." "If Andropov had better kidneys, the Soviet Union would still be around," Kontorovich said. But even after Andropovs death, the coming financial implosion was not immediately visible. Gosplan economists thought the system would keep chugging along until 2000, the last year for which they made forecasts. Beyond that deadline was uncertainty. Gosplans forecast, however, did not take into account the rise of Mikhail Gorbachev, who grabbed the reins at the end of 1985 and rode the Soviet Union into the grave. "No one dies of slow growth," he said. "The collapse was a political event." Around the time of Gorbachevs ascension, Khanin thought there were only two options — either relaunch the authoritarian model or kick-start market reforms along the lines of the Hungarian or Chinese models. "Neo-Stalinism was the most likely outcome, and I anticipated its onset," said Khanin. "And from the short-term economic perspective, it would have provided the best results." "No one in Gosplan thought about market reforms," said Zoteyev. "Peoples minds were focused on ways to improve the existing system." But after seeing Gorbachevs first moves, Gosplan economists lost hope. "It was clear that no combination of command and market economies was possible," Zoteyev said. "The convergence theory was an illusion." The only way to limit the appetites of the Soviet leadership was to cap plans to increase capital expenditures, which grew at a pace of 40 percent throughout the 1960s, but dropped to about 10 percent in the middle of the 1980s. "Everybody — from Defense Minister [Dmitry] Ustinov to the then-secretary of the Communist Partys Central Committee, Gorbachev — were lobbying for an increase in spending," said Zoteyev. Gorbachev had tried to increase spending, especially for agriculture, since he first arrived in Moscow in 1978 but was foiled because by the time he had the power to do so, the five-year plan ending in 1985 had been approved. When it came to approving the five-year plan for 1985-1990, however, Gorbachev was already secretary general, so Gosplan could not ignore his requests. In the mid-1980s, Gosplan was working the Communist Partys economic program through to the year 2000, carefully fabricating upcoming Soviet achievements. "At the core of it was growth in labor productivity of 150 percent," said Zoteyev. Such growth would have brought the Soviet Union to the same level as the United States, which, according to Gosplan, had a labor force 2.5 times more productive. "Other forecasts were equally scientific," said Zoteyev. "It became clear that with Gorbachev in the driving seat, the flop was growing inevitable." In 1988, Zoteyev quit his prestigious Gosplan post, opting for an academic career in one of the state-owned research institutes in Moscow. He is now deputy head of the department of growth rates and sector development with the Economic Development and Trade Ministry. Meanwhile, in the West, "Gorbymania" was taking its toll. At that time, saying Gorbachevs agenda was a pie in the sky was an anathema. "The common view was that Gorbachev was a modern-day Bukharin," said Martin Malia, a professor of history with the Institute of Slavic, East European, and Eurasian Studies at the University of California, Berkeley. "That was almost a religion." Nikolai Bukharin was the architect of the Soviet Unions New Economic Policy, which allowed for the development of private businesses in agriculture, services and food processing and which was implemented successfully by the Communists in the 1920s. It was succeeded by Stalins collectivization — the massive reorganization of farms — and purges, which were viewed as an aberration of real socialism by advocates of "socialism with a human face" in the 1980s. "My view was always that the system could not be reformed — it could only be abandoned," said Malia. But neither Malia nor any of his colleagues were able see the future. "The demise of the Soviet Union was something neither of us even dared to think of," said Zoteyev. Few institutions earned as much criticism for bad predictions regarding Soviet economic problems as the CIA, despite having the worlds largest budget for research on the Soviet Union. Partly to improve its image, the CIA later declassified thousands of documents pertaining to its research on the Soviet Union. Many of these documents show that CIA analysts were aware of the growing economic problems earlier than previously thought. "In my judgment, overall, the CIA performed admirably in meeting the challenges of assessing Soviet strengths and weaknesses," wrote former CIA director Robert Gates in the CIAs book "Analysis of the Soviet Union, 1947-1991," which was published in March. Many analysts remain unconvinced of the accuracy of the CIAs analyses despite its attempt at historical revisionism. "[The CIA] is now going through their papers, seeking evidence that they guessed correctly," said Goldman. A few analysts, on the other hand, still applaud the CIAs work. "In the 1970s, CIA economists were predicting slower rates of growth than most academics," said Kontorovich. "But their critics said the CIA intentionally distorted the picture, trying to make their adversary look weaker than it actually was." So why did market reforms fail under Gorbachev, who attempted a step-by-step approach based on the Chinese model? "The Soviets tried the Chinese approach in 1987-88, opening special economic zones, joint ventures, cooperatives — but the results were miserable," said Goldman. "The problem is, unlike agricultural China, the Soviet Union was a highly industrialized economy with large distortions," he said. China could afford to make adjustments to its economic system one step at a time, postponing restructuring of large industrial enterprises for up to 20 years. "But the Soviet Union had to tackle that problem immediately," said Goldman. Ten years after the demise of the Soviet Union, many of the free-market developments that have occurred in Russia seem to be natural ones. But before the collapse of the Soviet Union, not even the most radical thinkers were proposing anything like what has evolved. Economists were advocating reforms that were not dramatic enough and didnt address the key issues. Even Abel Aganbegyan, a man often called the architect of perestroika, managed to avoid using the phrase "private property" in the 250 pages of his 1988 manuscript, "The Economic Challenge of Perestroika." So did Nikolai Shmelyov and Vladimir Popov, who in 1989 wrote "The Turning Point," an account of the last years of the Soviet economy. But while Russia may have a more world-friendly economy than it did a decade ago, it is only about half the size. And the nation has lived through three banking crises, two defaults, two devaluations and a period of hyperinflation. The post-Soviet economic reform effort, built on Gorbachevs failures, has not produced miracles. "The irony is that Gorbachev is still highly respected in the West," said Goldman. "He appears to be a man who brought about a revolution without bloodshed."